Continues to receive frequent content, balance, and quality-of-life updates, including live service features like Seasons. Earlier physical copies of the game advertise an Auction House; this was permanently closed in early 2014 due to negative player feedback and developer review. As of Patch 2.4.3 Diablo 3 now runs in DirectX 11 and 64-bit. Some regions have in-game micro-transactions (not listed below). Players cannot progress past the Skeleton King, midway through Act I. The level cap is 13 as opposed to 60 (70 in the expansion). Matchmaking is available only with other Starter Edition players, including public matching and private invitations. Global Play is not available. Players attempting to connect to the Starter Edition in a region other than their Battle.net account's home region will receive an Error 12. Save games are stored on the Battle.net servers. Includes a Letterbox option to force 16:9 resolution regardless of aspect ratio. See the WSGF entry or use Flawless Widescreen or Widescreen Fixer. Change display mode to "Windowed (Fullscreen)" in-game. May require D3Prefs.txt edit. Color blind icons do not scale with resolution and are very small in 4K. 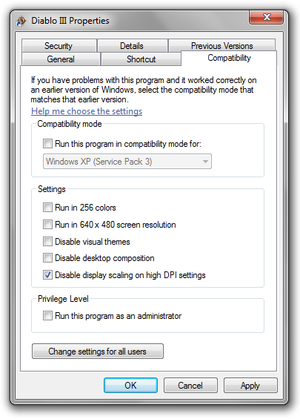 64-bit client includes options for multisampling from 2x up to 8xMSAA. True frame rate is capped at 60 FPS. Even if frame rate counters indicate the game is running at more than 60 FPS, all visuals (including camera movement) will only update at a maximum of 60 FPS. Icons to help distinguish between legendary and set items can be toggled on/off. Available for cinematic and quest dialogues. Can be toggled in options menu. See Helix Mod: Diablo III. Game client window becomes unresponsive when a dialog box is opened in the background. Demo version of Swiftshader, on Intel G41. We have detected that your video card is not supported by Diablo III. 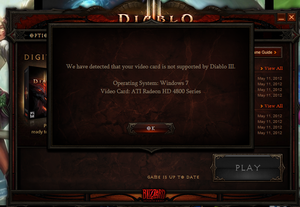 Diablo III will block certain systems running the game if it does not detect a certain spec of video card. However, it is possible to force the game to run on any video card (even if it does not meet the minimum specification of the game). ...if you decide to do this and have terrible performance as expected, please do not contact us reporting it. We know the unsupported cards aren't going to perform well and there's nothing we'll be able to do to remedy it. Pressing Esc instead of cancel will make one's computer attempt to load the client. Pressing cancel will load up a list of unsupported video cards on Blizzard's website. Change HardwareClass "0" to HardwareClass "1"
Change DisableTrilinearFiltering "0" to DisableTrilinearFiltering "1"
Using the program Swiftshader can successfully load the game even on extremely low powered machines. For example, the game can be run on integrated graphics as low powered as the Intel G41, albeit at extremely low frame rate. 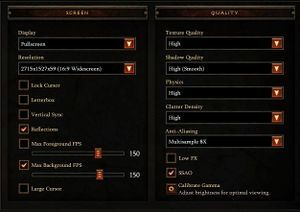 By default, it appears as if Diablo III has a number of issues with high or custom DPI settings in Windows. Mouse cursor not being moveable whilst in fullscreen mode. Mouse being imprecise on the screen. Taskbar showing over the game window. Right-click on the Diablo III shortcut (or Diablo III.exe) and go to the 'Compatibility' tab. Select, 'Disable display scaling on high DPI settings'. These messages may appear when trying to log in. This means that no license is attached to the Battle.net account, a problem with many users in Asia. Check this thread for more information. This message means that the login servers are at full capacity. Official advice is to try logging in later when the servers are less busy. Press cancel before anything happens. Log back in straight away. This might be considered an exploit of the way that the client is reporting Error 37 to indicate that servers are too busy. However, this does not seem to have any particular consequences, except that Blizzard's servers will be busy. Error 75 means that Blizzard servers are down. 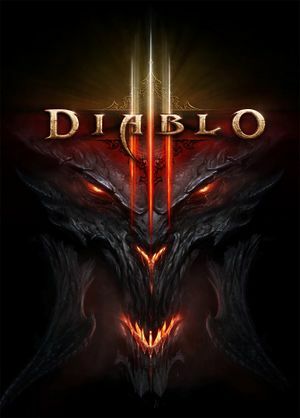 Check Diablo III Server Status page for updates. This is most likely caused by high or custom DPI settings in Windows. If one is stuck in fullscreen mode, one can change the D3Prefs.txt settings to force a windowed mode. 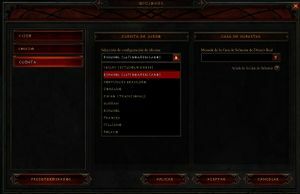 DisplayModeWindowMode "0" to DisplayModeWindowMode "1"
|This Battle.net account does not have a Diablo III License attached to it. A possible fix is to correctly set the region within the game settings, within the Options > Account > Server Region settings. 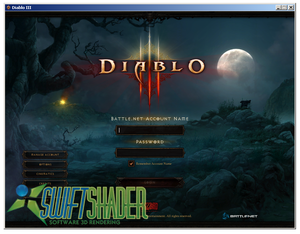 Running programs that put an overlay over Diablo III (such as Mumble and MSI Afterburner) can cause Diablo III to crash. Use these overlays at your own risk. Add -launch to the end of the target. If the game doesn't launch correctly, make sure the Battle.net Launcher application is already running before starting the game from Steam. 4. Save and exit the file, and try again. Update 8 June 2012: Blizzard appear to have restricted client language switching. Errors 81, 82 or 84 displays: "The client does not match the accounts native language. Please, use the game native client." There is no known fix as of yet, as Blizzard controls the language restrictions from their servers. Client language files can be adjusted from the options menu. Once the change is applied, a patch of approximately 3 GB is downloaded. Client language cannot be changed back until this download reaches the 'playable' state, and one re-enters the client to change the language option again. Some players are reporting the game getting stuck at installation in the "Updating game files" part. Turn off your anti-virus software and firewall. Loading the setup file again. Running the launcher as administrator. Select "View network status and tasks". Right click on each adapter and select "Disable". Leave your primary adapter (the one that provides your internet connection) enabled. You should now have only one enabled adapter. Check that you are still connected to the internet. Go to %PROGRAMDATA% and delete the Battle.net folder (if it exists). If the user has any connections configured in "Dial-up and Virtual Private Network settings" and they're set to "Dial whenever a network connection is not present," the install won't proceed past 10%. If the installation has yet to do anything you might need to make sure your secondary logon has been enabled. Do so by going through - Control Panel/Administrative Tools/Services, right click Secondary Logon and proceed to enable it by setting the start up type to automatic. Using settings in the D3Prefs.txt mentioned below one can achieve a reasonable frame rate on e.g. the MacBook Pro Mid 2010 with the Nvidia GeForce 330M. Check that you haven't enabled Caps Lock as that disables ⌘+Tab ↹, although ⌘+M still functions correctly. The 32-bit client is still available. Support for Windows XP and Windows Vista was dropped at the end of 2017. The game no longer runs on these versions after this change. However some legacy versions still exist for these users. This page was last edited on 13 November 2018, at 05:15.